Adding fish and seafood to a vegetarian eating plan can create the healthful diet clients crave. Pesce, the Italian word for fish, is being associated with people who add aquatic animals to a vegetarian diet. Pescetarians (sometimes called pesco-vegetarians) eat freshwater and saltwater fish and shellfish in addition to the fruits, vegetables, grains, legumes, eggs, and dairy vegetarians typically consume. While it isn't known how many people follow a pescetarian eating pattern, interest in the impact this diet has on its followers appears to be rising. The combination of the known benefits of a vegetarian lifestyle with the proven health effects of omega-3-fatty-acid-rich fish makes pescetarianism a potentially powerful ally in the interplay between nutrition and long-term health. "Pescetarians are a diverse group," says Debra King, MS, RDN, LD, FAND, CEO of Crown Consulting and Web editor for Vegetarian Nutrition. "In my experience, they're usually very health-conscious individuals. They're looking to take control of their health through the food choices they make." For some, pescetarianism may be a stepping stone on the way to true vegetarianism, or a compromise for vegetarians who feel the need to add a protein source readily available in business or social settings. "People who have health problems or want to lose weight may try pescetarianism," says Janis Jibrin, MS, RD, author of The Pescetarian Plan. "They've read about the detrimental health effects of red meat and the benefits of plant-based diets and omega-3 fatty acids in fish, and are looking for a convenient and doable way to make healthful choices." 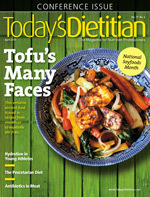 "The pescetarian diet is similar to the traditional Mediterranean diet: plant-based, with fish serving as the primary animal protein," says Sharon Palmer, RDN, nutrition editor of Today's Dietitian and author of Plant-Powered for Life. Like a Mediterranean eating pattern, a healthful pescetarian diet is loaded with fruits and vegetables, whole grains, nuts, and legumes. "It can be Mediterranean-style," Jibrin says, "but one could just as easily have a Nordic- or Japanese-based pescetarian diet. It's an extremely flexible way to eat. Also, most pescetarians, like vegetarians, include both dairy and eggs in their diets." Jibrin emphasizes the wide variety of aquatic life available to pescetarians, all of which she says are low in saturated fat and rich in other nutrients. "Shellfish like mussels, oysters, and clams are loaded with minerals," Jibrin says. "Oysters may be the most zinc-rich food on the planet, with one 4-oz serving providing about seven times the daily zinc requirement. Four ounces of mussels cover about 45% of the DV of iron and a whopping 144% of the DV of selenium to fuel the body's antioxidant system. That same amount of clams provides about one-quarter of most people's calcium requirement, as well as a day's worth of selenium." Other forms of seafood shouldn't be overlooked. "Shrimp and squid are nutritious, but they're high in cholesterol," Jibrin says. "Since the jury is still out on the impact of dietary cholesterol on our arteries, I continue to recommend these seafood options in moderation." While some people may choose a pescetarian diet over vegetarian to maximize their intake of the omega-3 fatty acids found in oily fish, such as salmon, trout, sardines, and mackerel, there are many freshwater and saltwater fish varieties available. "Eating two servings of fatty fish per week will go a long way toward providing a good omega-3 to omega-6 ratio," Jibrin says, "but all fish are lean choices, allowing the calorie conscious to eat a larger protein serving than would typically be possible with meats and poultry, or add more sides for the same calorie count." Penny Kris-Etherton, PhD, RD, distinguished professor of nutrition at Pennsylvania State University, mentions other nutritional benefits of fish and seafood, including the vitamin D in fatty fish and the calcium in fish eaten whole, such as anchovies. "Getting enough vitamin B12 on vegan and some vegetarian diets can be problematic," Kris-Etherton says. "Seafood is not only a lean protein, it's also a source of vitamin B12." "In addition, the study found that pescetarians had lower levels of blood cholesterol and blood pressure, as well as [decreased] risk of diabetes, blood pressure, and metabolic syndrome compared with nonvegetarians," Palmer says. "They even have a lower carbon footprint." While few studies look specifically at pescetarianism, Jibrin says there are "boatloads of relevant studies" on the similar Mediterranean diet, vegetarianism, and the benefits of eating fish. "Lower risk of heart disease, less dementia and depression, smarter kids, lower rates of type 2 diabetes and cancer—the potential benefits are truly impressive," Jibrin says. One of the key health-promoting components of a pescetarian diet is the long-chain omega-3 fatty acids found in fish (particularly fatty fish). "There are many good epidemiologic studies showing that higher consumption of fish and omega-3 fatty acids is associated with a lower risk of heart disease," Kris-Etherton says. "Collectively, the evidence to date strongly suggests benefits of fish/seafood and marine omega-3 fatty acids for the primary prevention of cardiovascular disease." Data from the Cardiovascular Health Study indicated that in older adults, higher dietary intake of DHA and EPA (the long-chain fatty acids found in fish) may lower the risk of fatal heart attacks, and that higher levels of omega-3 fatty acids in the blood are associated with a lower incidence of congestive heart failure.2,3 "Some recent controlled clinical trials in patients with heart disease haven't demonstrated a beneficial effect of fish oil," Kris-Etherton notes. "For secondary prevention in coronary patients, modern pharmacotherapy appears to be of greater benefit over marine omega-3 fatty acids." Other research shows that eating fish may be good for the brain as well as the heart. "A long-term study in the UK [indicated] that children born to women who ate at least 12 oz of fish per week during pregnancy had higher IQs and better social, fine motor, and communication skills than kids whose moms ate fewer than 12 oz, and a study by Chicago's Rush Institute for Healthy Aging found that over a four-year period, Chicagoans aged 65 to 94 who had at least one fish meal per week had a 60% lower risk of developing Alzheimer's disease compared with those who rarely or never ate fish," Jibrin says. "It's not just the presence of fish. It's the presence of all those plant foods, too," Palmer says. "This is a huge aspect of the health benefits seen in this diet style." In a 2009 study, Fraser and colleagues concluded, "There is convincing evidence that vegetarians have lower rates of coronary heart disease, largely explained by low LDL cholesterol, probable lower rates of hypertension and diabetes mellitus, and lower prevalence of obesity. Overall, their cancer rates appear to be moderately lower than others living in the same communities, and life expectancy appears to be greater. "4 A study on the effects of a vegetarian diet on the risk of developing type 2 diabetes concluded that all variants of plant-based diets, including pescetarian, were associated with a substantially lower risk of type 2 diabetes and lower BMI than nonvegetarian diets.5 "It makes sense," Palmer says. "As you increase your intake of plant foods, decrease your intake of red and processed meats, and prioritize fish—animal foods that contain better fat profiles and omega-3s—you're likely to improve your overall health." The presence of mercury and other toxins in fish, combined with environmental and sustainability concerns, raises questions about the viability of a fish-and-seafood-based diet. "Some studies have shown that the benefits of eating fish outweigh the risks related to mercury," Palmer says. "Generally, the larger and more predatory the fish, the higher the mercury. I think dietitians can educate consumers to eat lower on the food chain when it comes to fish." The 2010 Dietary Guidelines for Americans recommend adults eat 8 oz or more of seafood per week. Pregnant and breast-feeding women should aim for 8 oz to 12 oz of a variety of seafood, but should limit albacore tuna to 6 oz per week, and avoid tilefish, swordfish, shark, and King mackerel due to their high mercury content. The guidelines specifically recommend salmon, anchovies, herring, sardines, Pacific oysters, trout, and Atlantic and Pacific mackerel (not King mackerel) as choices higher in EPA and DHA and lower in mercury.6 These guidelines can fit well with a pescetarian eating pattern. "It's important to remember that a pescetarian diet doesn't mean that one should eat fish three times a day," Palmer says. "It's a vegetarian diet that includes fish. So that means lots of meals that are based on plant proteins, too—beans, lentils, tofu, nuts, seeds." Jibrin recommends a pescetarian diet to clients who are interested in trying a more plant-based diet but aren't ready to become vegetarian or vegan. "It's a compromise that doesn't compromise their health," Jibrin says. According to Palmer, pescetarianism is a simple transition into a more plant-based lifestyle. "In my experience, I see many people who like to make small incremental changes in their diet and lifestyle, such as giving up red meat, doing Meatless Monday, or becoming pescetarian. They may find that as they try these lifestyle changes, they're ready to embrace even more plant-based meals during the week." Variety is important in any diet, and so is overall diet quality, King says. While the components of a pescetarian eating plan are healthful, King says that eating fish seven days per week, consuming uncontrolled portions, and munching on deep-fried fish sticks still aren't good choices. "I think it's important to educate clients that a pescetarian diet does not mean they must eat fish at every meal," Palmer says. "It means that a person enjoys lots of plant-based meals—vegetarian lasagna, veggie chili with cornbread, tofu vegetable stir-fry with brown rice—in addition to a few meals during the week based on fish." Many health-conscious Americans are looking for a dietary pattern that will give them the maximum proven nutritional benefit with the minimum sacrifice and inconvenience. With its focus on plant-based foods, pescetarianism delivers a powerful portion of vitamins, minerals, phytochemicals, fiber, and healthful fats. Adding fish and other seafood not only boosts intake of heart-healthy long-chain omega-3 fatty acids but also increases the variety of available lean proteins. Some guidance on how to build plant-based meals and choose sustainable, low-mercury fish can ease clients' transition to delicious, nutritious, health-promoting pescetarianism. This curry is just as delicious with scallops or shrimp instead of cod. 1. Heat a large, heavy-bottom stockpot over low heat. Add the olive oil and onion, and cook until translucent, stirring often, 5 minutes. Add the cumin, mustard powder, turmeric, ginger, garlic, salt, black pepper, and cayenne. Cook for 1 more minute, stirring constantly. 2. Add the tomatoes, cilantro, and water. Bring to a boil, reduce to a simmer, and cook for 10 minutes. 3. Add the cauliflower; return to a simmer, and cook for 2 minutes. 4. Add the cod, peas, and spinach; stir and cover. Simmer for 4 minutes, and serve immediately. — Recipe by Sidra Forman From The Pescetarian Plan by Janis Jibrin, MS, RD (Ballantine Books, New York, 2014). This crowd-pleaser is equally delicious with mussels instead of clams. 1. Heat a large pot with lid over low heat. 3. Add the clams, red pepper flakes, and wine. 4. Cover and simmer until the clams open, 7 minutes. Discard the clams that don't open. 5. Add the pasta, parsley, and tomatoes. Cover and let simmer for an additional 3 minutes. 6. Stir and serve immediately.